Feeling frazzled and need some time out? Take a moment to mindfully release the stresses of the day. This essential oil blend is perfect for a little oasis of recovery at any time of day or night. The deeply peaceful woody fragrance, with a hint of incense, has a balancing warmth of Benzoin which is anchored with a tranquil earthy base of Vetiver and Frankincense. The cleansing citrus top notes lift this intriguing scent, and feels steadying to the mind. Roll onto pulse points such as your wrists and neck or the back of your hands. Breathe deeply, gather your resolve, and inhale the peaceful aroma. 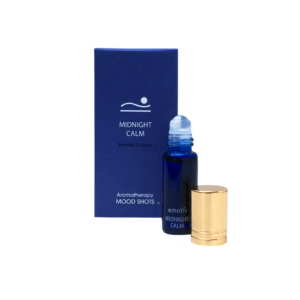 A deeply peaceful essential oil blend with a glide-on roller ball applicator (4.3ml). Freshly made in small batches in the UK. The pack includes a drawstring pouch for storage and travel. Caution: Not recommended during pregnancy. Not suitable for children. Avoid exposing skin area to direct sunlight or sunbed for 12 hours after use. Ingredients: Caprylic/Capric Triglyceride (Fractionated Coconut Oil), Pelargonium Graveolens (Geranium) Leaf Oil, Boswellia Carterii (Frankincense) Oil, Citrus Bergamia (Bergamot) Peel Oil, Vetiveria Zizanoides (Vetiver) Root Oil, Styrax Tonkinensis (Benzoin) Resin Extract, Citrus Limon (Lemon) Peel Oil, Tocopherol, Helianthus Annuus (Sunflower) Oil, d-Limonene*, Citral*, Geraniol*, Linalool*, Citronellol*, Benzyl Benzoate*, Benzyl Cinnamate*. *Naturally occuring in essential oils. 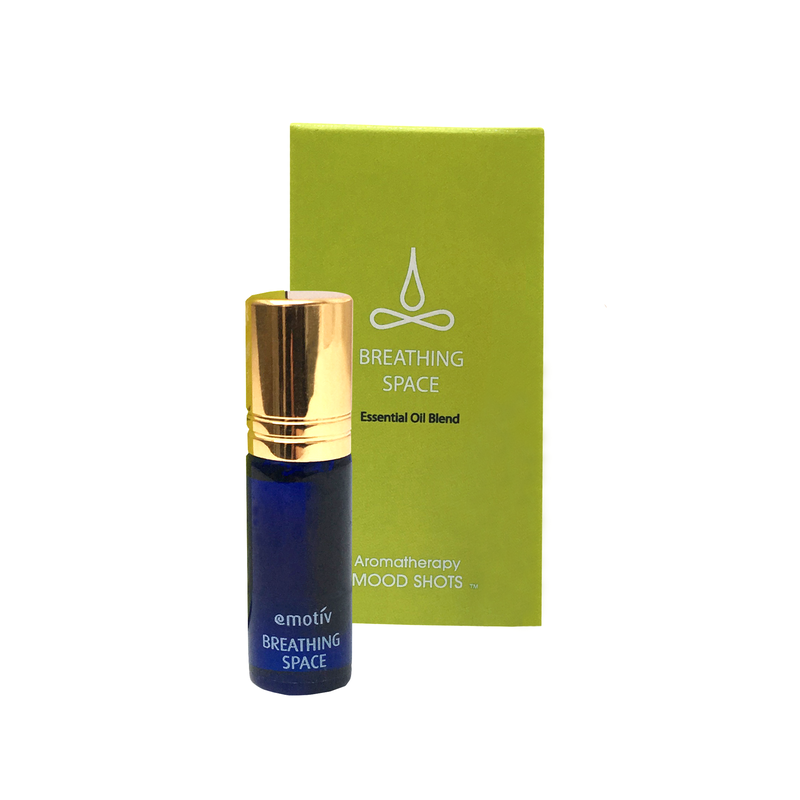 Emotiv Aromatherapy Mood Shots are little pots of potent plant power for your own personal sanctuary wherever you are. An oasis of calm, a shot of energy, a moment of mindfulness… what is your need today? Create a quiet ‘time-out ritual’ by rolling onto pulse points or the back of your hands. Breathe deeply, gather your intent, and inhale the beautiful aroma. Emotiv Aromatherapy currently ship within the UK using Royal Mail at their published rates, plus a small charge to cover packaging costs. Emotiv Aromatherapy aim to process and despatch orders within 3-5 working days of receipt. As the products are freshly made in small batches, this will depend on the production day and stock availability of the latest batch. Please allow additional time for Royal Mail delivery. If you wish to cancel or change your order because you have changed your mind, please contact us by email at [email protected] as soon as possible to arrange. If you cancel your order before it is shipped out you will receive a full refund. If your order has already been despatched, you will need to return the product to Emotiv Aromatherapy at your own cost and comply with the conditions for returns. You will be entitled to return a product for exchange or refund if: Emotiv Aromatherapy receive the returned product within 14 days, beginning with the day after the date that it is despatched to you. The returned product is unused, in its original unopened packaging with any seals and labels still intact, and in good condition allowing resell of the product as new. You comply with the Returns Procedure. You must contact us first by email to arrange, and then send the product to Emotiv Aromatherapy. Returns cannot be accepted without a return number and pre-arrangement. The product must be well packaged to ensure that it is not damaged in transit. Products returned must be sent by Royal Mail ‘Signed For’ to the address provided when the return is arranged with us. This policy does not affect your statutory rights as a consumer. Emotiv Aromatherapy aims to deliver the best possible product with the utmost care. However if any of your items do arrive damaged or there are errors, please email a photo of the damaged or incorrect item to [email protected] within 3 days of receipt. It may not be possible to rectify after this time. You may be asked to return the damaged items, so please retain the product and packaging. You will be refunded any reasonable return postage costs. Proof of posting costs will be required. Where items are damaged in transit you may be asked to provide information to help reclaim costs. Disclaimer: No claims are made as to any medicinal value of these formulas, products or oils. This information should not be used as a substitute for medical counselling with a health care professional. Always seek the advice of a doctor with any questions you may have regarding any medical condition. Safety Advice: Essential oils may be the natural products of plants, but they are extremely concentrated and very powerful. Their potency should be respected and they should be used with great care. Never use essential oils undiluted. Our blends have already been diluted to safe levels for use on your skin and been approved by a qualified registered Safety Assessor. Some oils may cause skin irritation in people with sensitive skin. It is recommended to perform a patch test before use. To patch test, place one drop on the back of your wrist and leave for an hour or more. If irritation or redness occurs wash the area with a vegetable oil such as olive oil, then cold water and do not use the oil. We do not recommend using essential oils during pregnancy. If you have an underlying medical condition, serious illness, or are taking medication you should consult a doctor before using essential oils. Never take essential oils internally. Please read the Instructions for Use and Warnings on our packaging before using our blends. By purchasing the products you understand and accept that essential oils may cause sensitivity in some individuals and that Skinsitiv Ltd (Emotiv Aromatherapy) will not be held responsible for such occurrence. Skinsitiv Ltd (Emotiv Aromatherapy) accepts no liability for misuse of essential oils or other products or for any reliance on the information provided by us.